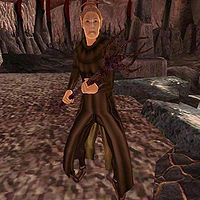 Boethia's Chosen are the contestants that you must defeat in the Tournament of the Ten Bloods to prove your worth to the Daedric Prince Boethia. Depending on your race, one of them won't appear during the quest. All of them possess a unique ability named Boethia's Chosen One's Blessing, which confers them an impressive boost to their abilities: Fortify Luck, Speed and Strength by 30 points, Fortify Agility and Endurance by 20 points, Fortify Blade, Blunt and Marksman by 30 points, Fortify Health and Magicka by 50 points and 30% Shield. Also, all of them are able to cast the Heal Minor Wounds spell. Boethia: Prove your worthiness to Boethia in the Tournament of Ten Bloods. This Chosen One is a female Argonian. She wears a leveled cuirass that is always unenchanted along with a leveled pair of pants. She is armed with an unenchanted leveled bow, a single steel arrow and a leveled longsword that may be enchanted at level 3 and above. Starting at level 3 she will also carry a leveled quantity of magical arrows and a leveled quantity of strong potions of healing as well as a strong poison of Illness and a weak poison of Paralysis. She is able to cast a leveled Chameleon spell and a leveled Destruction spell. This Chosen One is a male Breton. 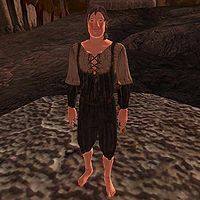 He wears two leveled pieces of lower-class clothing consisting of a shirt and a pair of pants although starting at level 3 he will wear an enchanted light cuirass instead. 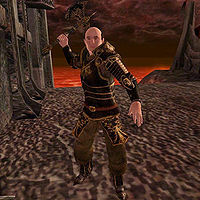 He is armed with a leveled blunt weapon that may be enchanted starting at level 3 and will also carry a staff to use as a secondary weapon starting at level 6. He also carries a leveled quantity of strong potions of Healing and strong potions of Sorcery along with a single strong poison of Paralysis. He is also able to cast the standard set of Bandit Hedge Wizard spells. 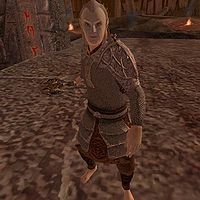 This Chosen One is a male Dunmer. He is clad in a leveled light cuirass that is always unenchanted combined with a leveled pair of lower pants. 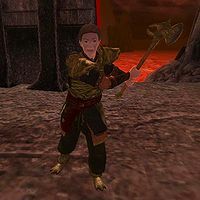 He is armed with an enchanted leveled bow along with a single steel arrow and a leveled quantity of magical arrows starting at level 3. He also carries around a leveled blunt weapon that may be enchanted starting at level 3, a leveled amount of strong potions of Healing and a strong poison of Illness. He is able to cast a leveled Bound Armor spell and a leveled Alteration spell. 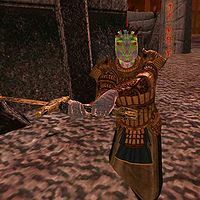 Boethia mentions that the Dunmer are his favorite race in Tamriel before the player enters combat with this one; yet he claims that since he is fair, he doesn't influence the fight. This Chosen One is a female Altmer. She wears a monk robe along with a leveled pair of shoes. She is armed with a leveled blunt weapon that is always unenchanted and starting at level 5 she will also use a leveled staff as a secondary weapon. She carries a leveled quantity of potions of sorcery, strong potions of Sorcery and strong potions of Healing. She is able to cast the standard set of Necromancer spells but she does not possess the unique Necromancer birthsign. This Chosen One is a male Imperial. He is clad in a leveled heavy cuirass and boots that are always unenchanted along with a leveled pair of lower pants. He is armed with a leveled blunt weapon, always unenchanted, and also carries around a leveled amount of strong potions of Healing and strong potions of Sorcery along with a weak poison of Paralysis and a strong poison of Illness. He is able to cast a leveled set of spells from all the magical schools. 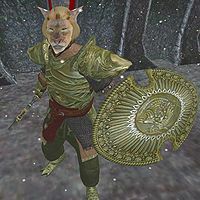 This Chosen One is a male Khajiit. He always wears a few leveled pieces of armor that are always unenchanted, including cuirass, boots and gauntlets along with a shield and a leveled pair of pants. He is armed with a leveled blunt weapon that may be enchanted starting at level 3 and also carries around a leveled quantity of strong potions of Healing, a strong potion of Reflection and a strong poison of Illness. 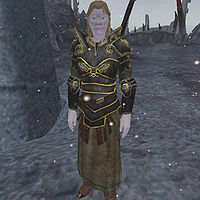 This Chosen One is a female Nord. 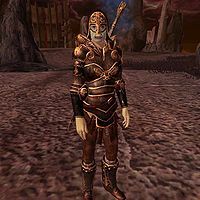 She wears leveled heavy boots along with a leveled heavy shield, a leveled pair of pants and, starting at level 3, she also wears an enchanted leveled heavy cuirass. She wields a leveled longsword that may be enchanted starting at level 3 and also carries a leveled quantity of strong potions of Healing, a strong potion of Reflection and a strong poison of Illness. 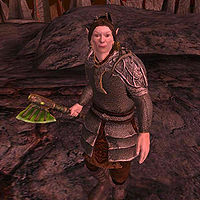 This Chosen One is a female Orc. She is clad in a leveled set of heavy armor that includes boots, cuirass and helmet that are always unenchanted along with a leveled pair of lower pants. She relies on a leveled two-handed weapon that may be enchanted starting at level 3 and also carries a leveled amount of strong potions of Healing, a strong potion of Reflection and a strong poison of Illness. This Chosen One is a male Redguard. He is armored with a leveled light cuirass and boots combined with a pair of leveled lower pants and a leveled light shield, all the armor is always unenchanted. He is armed with a leveled blunt weapon that may be enchanted starting at level 3 and also carries in his inventory a leveled quantity of strong potions of Healing, a strong potion of Reflection and a strong poison of Paralysis. This Chosen One is a male Bosmer. He is clad in a leveled light cuirass and boots that are always unenchanted along with a pair of leveled pants. Starting at level 3 he will be armed with a leveled magic bow, along with a single steel arrow and a leveled blunt weapon that may be enchanted starting at level 3. He also carries two weak potions of Healing and two strong poisons of Illness. While the Breton Chosen is intended to have the Bandit Wizard birthsign it is implemented through a leveled list which does not actually apply it. This page was last modified on 17 July 2018, at 03:39.